I'm looking for an easy way (a command or series of commands, probably involving find) to find duplicate files in two directories, and replace the files in one directory with hardlinks of the files in the other directory. Here's the situation: This is a file server which multiple people store audio files on, each user having their own folder. Sometimes multiple people have copies of the exact same audio files. Right now, these are duplicates. I'd like to make it so they're hardlinks, to save hard drive space. Traverse all directories named on the command line, compute MD5 checksums and find files with identical MD5. IF they are equal, do a real comparison if they are really equal, replace the second of two files with a hard link to the first one. rdfind does exactly what you ask for (and in the order johny why lists). Makes it possible to delete duplicates, replace them with either soft or hard links. Combined with symlinks you can also make the symlink either absolute or relative. You can even pick checksum algorithm (md5 or sha1). Available in most package handlers (e.g. MacPorts for Mac OS X). with filename1 and filename2 being identical and filename3, filename4 and filename5 also being identical. Since your main target is to save disk space, there is another solution: de-duplication (and probably compression) on file system level. Compared with the hard-link solution, it does not have the problem of inadvertently affecting other linked files. ZFS has dedup (block-level, not file-level) since pool version 23 and compression since long time ago. If you are using linux, you may try zfs-fuse, or if you use BSD, it is natively supported. On modern Linux these days there's https://github.com/g2p/bedup which de-duplicates on a btrfs filesystem, but 1) without as much of the scan overhead, 2) files can diverge easily again afterwards. To find duplicate files you can use duff. Duff is a Unix command-line utility for quickly finding duplicates in a given set of files. To create hardlinks to those files automaticly, you will need to parse the output of duff with bash or some other scripting language. Description: Hardlinks multiple copies of the same file Hardlink is a tool which detects multiple copies of the same file and replaces them with hardlinks. copy fails, or if --reflink=auto is specified, fall back to a standard copy. Do any methods do this? Look at duff, fdupes, rmlint, fslint, etc. Can filename comparison be added as a first step, size as a second step? Basically, it just traverses a directory, calculating the SHA1sum of the files in it, hashing it and linking matches together. It's come in handy on many, many occasions. echo ln -f "$OLDFILE" "$NEWFILE"
This finds all files with the same checksum (whether they're big, small, or already hardlinks), and hardlinks them together. This can be greatly optimized for repeated runs with additional find flags (eg. size) and a file cache (so you don't have to redo the checksums each time). If anyone's interested in the smarter, longer version, I can post it. NOTE: As has been mentioned before, hardlinks work as long as the files never need modification, or to be moved across filesystems. The applicatios FSLint (http://www.pixelbeat.org/fslint/) can find all equal files in any folder (by content) and create hardlinks. Give it a try! If you'll do hardlinks, pay attention on rights on that file. Notice, owner, group, mode, extended attributes, time and ACL (if you use this) is stored in INODE. Only file names are different because this is stored in directory structure, and other points to INODE properties. This cause, all file names linked to the same inode, have the same access rights. You should prevent modification that file, because any user can damage file to other. It is simple. It is enough, any user put other file in the same name. Inode number is then saved, and original file content is destroyed (replaced) for all hardlinked names. Specially look at ZFS filesystem. This is available as FUSE, but in this way it's very slow. If you want native support, look at the page http://zfsonlinux.org/ . Then you must patch kernel, and next install zfs tools for managament. I don't understand, why linux doesn't support as drivers, it is way for many other operating systems / kernels. File systems supports deduplication by 2 ways, deduplicate files, or blocks. ZFS supports block. This means, the same contents that repeats in the same file can be deduplicated. Other way is time when data are deduplicated, this can be online (zfs) or offline (btrfs). Under linux you should take care for ZFS because not all work as it should, specialy when you manage filesystem, make snapshot etc. but if you do configuration and don't change it, all works properly. Other way, you should change linux to opensolaris, it natively supports ZFS :) What is very nice with ZFS is, this works both as filesystem, and volumen manager similar to LVM. You do not need it when you use ZFS. See documentation if you want know more. My solution would be to create a "common" file in a hidden folder, and replace the actual duplicates with symbolic links... then, the symbolic links would be embedded with metadata or alternate file streams that only records however the two "files" are different from each other, like if one person wants to change the filename or add custom album art or something else like that; it might even be useful outside of database applications, like having multiple versions of the same game or software installed and testing them independently with even the smallest differences. 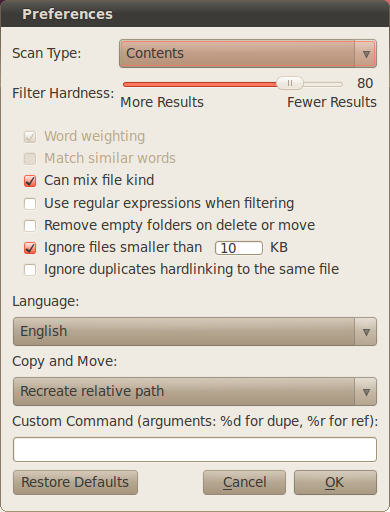 These options affect how duplicate deletion takes place. Most of the time, you don’t need to enable any of them. The deleted files are replaced by a link to the reference file. You have a choice of replacing it either with a symlink or a hardlink. ... a symlink is a shortcut to the file’s path. If the original file is deleted or moved, the link is broken. A hardlink is a link to the file itself. That link is as good as a “real” file. Only when all hardlinks to a file are deleted is the file itself deleted. On OSX and Linux, this feature is supported fully, but under Windows, it’s a bit complicated. Windows XP doesn’t support it, but Vista and up support it. However, for the feature to work, dupeGuru has to run with administrative privileges. Not the answer you're looking for? Browse other questions tagged files hard-link deduplication duplicate-files or ask your own question. How to clean up my desktop? Multiple Linux or Unix Distributions, Same Home Partition or Data? How to delete all duplicate hardlinks to a file? How does tar deal with hardlinked files?